Emphasizing the search for patterns within and between biological sequences, trees, and graphs, Combinatorial Pattern Matching Algorithms in Computational Biology Using Perl and R shows how combinatorial pattern matching algorithms can solve computational biology problems that arise in the analysis of genomic, transcriptomic, proteomic, metabolomic, and interactomic data. It implements the algorithms in Perl and R, two widely used scripting languages in computational biology. The book provides a well-rounded explanation of traditional issues as well as an up-to-date account of more recent developments, such as graph similarity and search. It is organized around the specific algorithmic problems that arise when dealing with structures that are commonly found in computational biology, including biological sequences, trees, and graphs. For each of these structures, the author makes a clear distinction between problems that arise in the analysis of one structure and in the comparative analysis of two or more structures. He also presents phylogenetic trees and networks as examples of trees and graphs in computational biology. 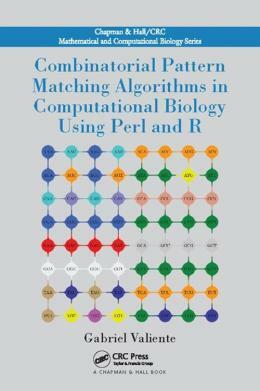 This book supplies a comprehensive view of the whole field of combinatorial pattern matching from a computational biology perspective. Along with thorough discussions of each biological problem, it includes detailed algorithmic solutions in pseudo-code, full Perl and R implementation, and pointers to other software, such as those on CPAN and CRAN.